Now that our oldest left the nest and our youngest moved into his vacated bedroom in the basement, our thoughts go to what function this empty room should have. Regardless of its new purpose, we've got to tone down the walls that are as loud as the music that once blasted from them. After some deliberation over whether it should be turned into a craft room, we decided instead to transform this space from a teenage pad to a calm guest room. The captain's bed has been in my family for over 40 years and it now resides in our backyard because we repurposed it into a Twin Headboard Outdoor Bench. The desk unit was my husband's growing up and after painting it solid white, it now resides in my home office. That left a completely blank slate to work with and the first thing we did was paint the walls a light taupe and a feature wall in dark Iced Espresso. We thought about putting a double or queen size bed in this space but the room is rather small Considering our most frequent guest is my sister or our son for the holidays we opted for a single. We purchased an inexpensive bed frame and made an upholstered headboard that mounted on the wall with D-hooks. It was our first attempt at making a headboard and I think it looks pretty good. I found the glass lamp on clearance for under $40 at Homesense (Canadian retailer). When I saw the bedding there too, the colors and pattern were perfect for this space. Unfortunately, it only came in a Queen so I altered the comforter to fit the twin bed. Tucked on the left side of the bed is a curbside find French Graphic Table that I gave a makeover. On the right side of the bed is the Faux Secretary Desk that was once part of my parent's first bedroom set when they got married in 1958. The bolster on the bed was a dud project meant for another room. I wasn't happy at all with the cushion and threw it in the bottom of a fabric tote. Recently I bought some pretty ribbon on clearance with the intention of sewing a pillow for the bed. When I opened the fabric tote and saw the discarded bolster - 15 minutes at the sewing machine later and we have a pretty bolster perfect for this space. The Balloon Back Chair pictured above was our first attempt at upholstery. Little did we know that awaiting underneath was one hot mess. Have you ever seen the inside of an antique chair? I found the beveled mirror on sale for $20. 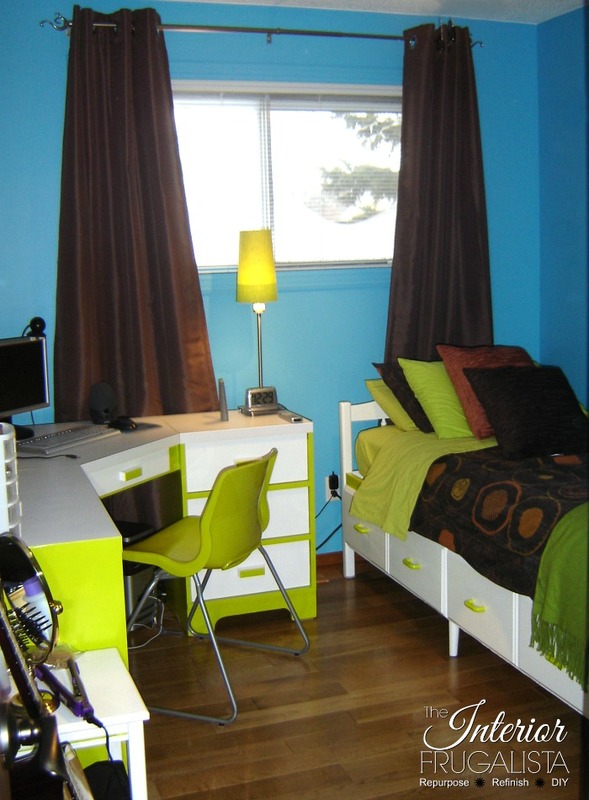 Quite a difference between the teenage pad to the calm guest room retreat, wouldn't you say? I'm thrilled that I was able to put this budget-friendly room together with clearance finds and DIY projects.